The Vela offers Maxi-Cosi’s ISOFIX compatible system, ISOGO, a patented ISOFIX compatible soft latch system, which enables parents to secure the child’s car seat quick and safely in 3 simple steps and gives them confidence that the seat is always correctly installed. The Vela also comes with the Maxi-Cosi unique ‘Cool Baby’ wicking fabric, to keep baby cool and comfortable. Rearward facing up to approximately 12 months and forward facing to approximately 4 years, this is a great long lasting car seat. Still featuring Air Protect Superior Side Impact Technology to shield the child's head from side impact forces. Air Protect Superior Side Impact Protection keeps baby safe, by consistently removing the forces generated in the instance of an accident; keeping their head safe & secure. 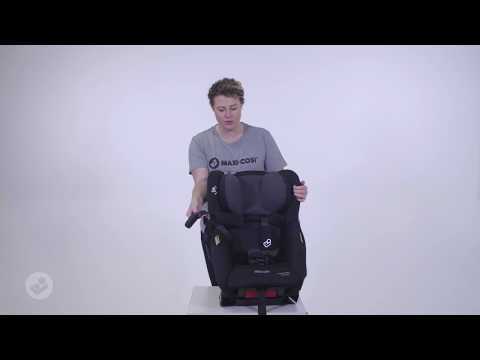 Maxi-Cosi slim-line convertible car seat: fits 3-Across in Australia’s most popular cars. Compact fitment in rearward & forward facing: Ensuring enough leg room & comfort for those seated in the front seats of the car. Rearward Facing up to 30 months: In the event of an accident, a child is protected most when rearward facing. With the ability to rearward face up to 30 months, your child is safely covered with Maxi-Cosi. NEW rearward facing foot cover keeping baby comfortable and safe.